On January 19, 2018, NOAA Fisheries determined that Tyonek, the male beluga whale calf found stranded and rescued from the Cook Inlet, is not able to be released back into the wild. He is not capable of surviving on his own and has been under the watchful care of Alaska SeaLife Center (ASLC) since his rescue on September 30, 2017. Once an animal is deemed not releasable, the search for a forever home at a U.S. facility begins. In February of 2018, NOAA Fisheries announced that after review and in the best interest of Tyonek, SeaWorld in San Antonio, Texas is Tyonek’s new home. SeaWorld San Antonio was selected due to the facility’s ability to accommodate his social and medical needs and contribute to scientific research on the species to help conservation efforts in the wild. Tyonek has successfully moved from ASLC to SeaWorld San Antonio and has already begun to settle into his new home. He is receiving around-the-clock care from SeaWorld animal care team members. We are thrilled Tyonek has a second chance at life after his rescue by Alaska State Troopers and ASLC. Less than 24 hours after his rescue, Georgia Aquarium sent staff to Seward, Alaska to assist ASLC with the 24-hour care of Tyonek. Since his rescue, Georgia Aquarium sent 12 animal care team members totaling more than 250 days to help this little whale. We could not be more pleased he is at SeaWorld in San Antonio to become a part of their beluga whale social group. Specifically, beluga whales in the Cook Inlet population are endangered. Tyonek’s chance of survival was minimal when he was found stranded, but that he continues to thrive and help researchers learn more about this valuable species is so important. Georgia Aquarium looks forward to continuing our contribution to the overall knowledge of beluga whales and working alongside our partners at Shedd Aquarium, SeaWorld, and Mystic Aquarium to care for the collective population of beluga whales in the United States. For NOAA’s announcement on Tyonek’s non-releasable status, please click here. For more information on Tyonek’s move to SeaWorld San Antonio from the Alaska SeaLife Center, please click here. Since being rescued nearly two months ago in Cook Inlet, Alaska, beluga calf Tyonek has been steadily progressing at the Alaska SeaLife Center! He recently moved to an outdoor pool and his activity and endurance are increasing. We’re honored to continue helping the Alaska SeaLife Center with his care alongside our partners at SeaWorld, Shedd Aquarium, Vancouver Aquarium, and Mystic Aquarium. Tyonek update! 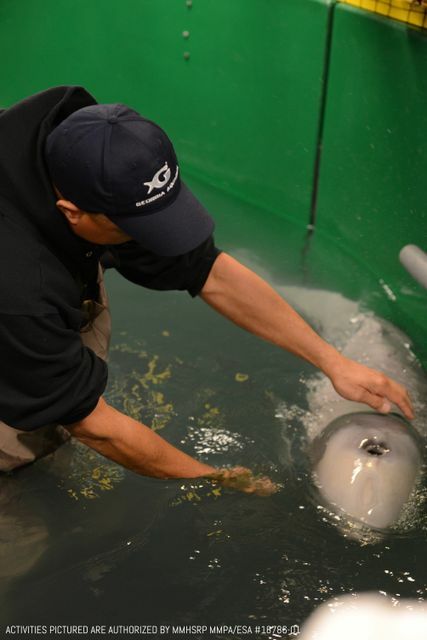 This rescued beluga calf is making a great improvement at the Alaska SeaLife Center. He recently transitioned to an outside pool, a positive sign that his body condition and health continue to progress. He is also now able to successfully feed completely on bottles rather than needing tube feedings. Our team continues to assist with his 24/7 care and we are honored to be a part of Tyonek’s rehabilitation journey. The rescued calf, Tyonek, at the Alaska SeaLife Center continues to show progress and gain weight as he takes in more calories. Despite having less than a 10% chance to live, this "little chief" is responding well to therapy. Tyonek is still under 24/7 monitoring and members from our animal care team are on site assisting the Alaska SeaLife Center and aquarium partners with his care. 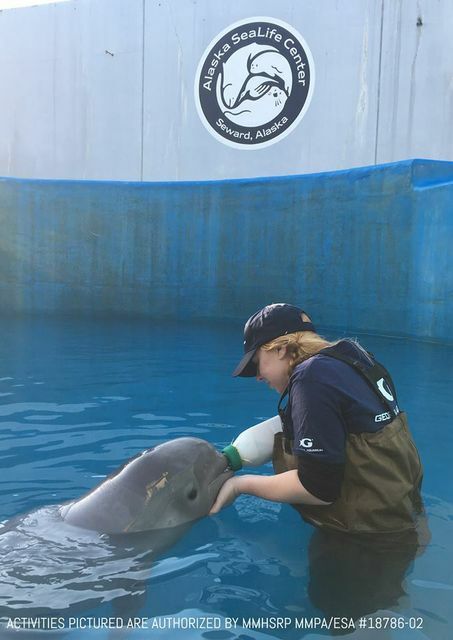 The rescued beluga whale calf has a name - Tyonek, which is the name of the village closest to where the young male calf was found stranded. Tyonek translates to "little chief." Although the past few days have been a little tough for this young calf as he has been experiencing some mild gastrointestinal issues, today he is much livelier after animal care and veterinary teams modified his formula. The changes helped reduce some of the gas and discomfort for the young whale as he adjusts to a special formula. He continues to positively interact with those caring for him 24/7, including George and Kristen from Georgia Aquarium. We are proud to assist the Alaska SeaLife Center with his care alongside partners at Shedd Aquarium, SeaWorld, Vancouver Aquarium, and Mystic Aquarium. 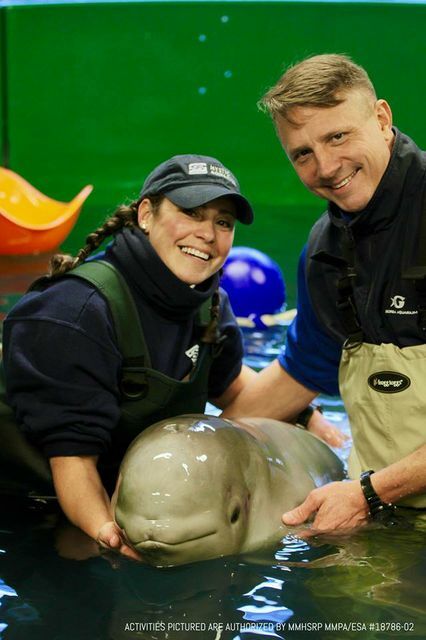 This photo is of Kristen Hannigan, senior trainer, who has spent the last two weeks helping to care for the orphaned beluga whale calf at the Alaska SeaLife Center. “Being a part of the expert team working tirelessly to provide care for this calf is such an honor. 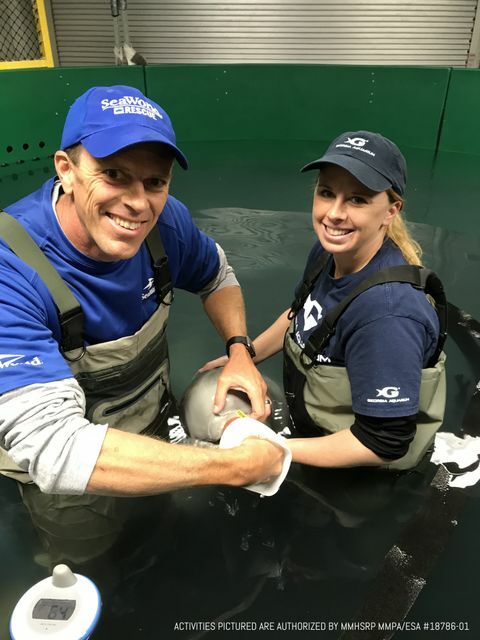 When caring for a rescued animal, the nights and days are long and the work can be tiring, but it’s all worth it!” We're proud to partner with Shedd Aquarium, SeaWorld, Vancouver Aquarium, and Mystic Aquarium on this effort. 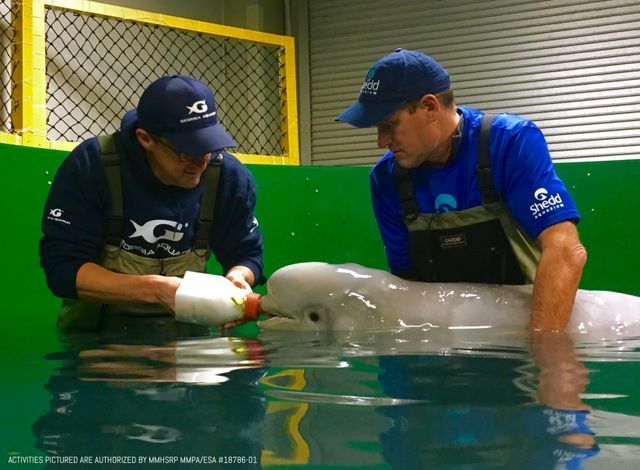 The orphaned beluga calf has started feeding on a bottle, taking in the specially made formula. The team led by the Alaska SeaLife Center is focusing on the calf’s nutrition and growth by feeding him every 3-4 hours. The calf still has a long way to go, but the team is encouraged by his latest development. We're proud to partner with Shedd Aquarium Vancouver Aquarium SeaWorld Mystic Aquarium on this effort. Sound on for another update from the Alaska SeaLife Center! This little one suckles specially made formula by his caregivers through a tube to receive much-needed nutrients. Hydration is vital for the improvement of the calf’s health and Georgia Aquarium team members along with partners at Shedd Aquarium, SeaWorld, Vancouver Aquarium, and Mystic Aquarium, continue to assist the Alaska SeaLife Center with 24/7 care. All helping hands are on deck as care continues for this endangered animal. Led by the Alaska SeaLife Center, the teams are focused on rehydration of the calf. He is stabilizing and swimming on his own. Georgia Aquarium marine mammal team members remain on-site alongside partners at Shedd Aquarium, SeaWorld, Vancouver Aquarium, and Mystic Aquarium. We’ll continue to provide updates on the calf and make sure to follow along with us on Facebook and news.georgiaaquarium.org. SEWARD, Alaska (October 5, 2017) – On Saturday, Sept. 30, an orphaned, four-week old beluga whale calf was rescued from Cook Inlet, Alaska and taken to the Alaska SeaLife Center (ASLC) in Seward, Alaska. Georgia Aquarium staff immediately answered the call sent out by ASLC for beluga whale experts to help with the constant and vital 24-hour-a-day care. Assistance is also hailing from partner facilities: Vancouver Aquarium, Shedd Aquarium, SeaWorld, and Mystic Aquarium. Found alone and in distress near Trading Bay in Western Cook Inlet, the calf was transported to the Alaska SeaLife Center, under a permit by the National Oceanic and Atmospheric Administration Office (NOAA). The calf, a male, is a member of the critically endangered Cook Inlet beluga whale population, which has declined to approximately 328 individuals left in the wild. He is under 24-hour monitoring and support, and receiving veterinary treatment and ongoing assessment. Veterinarians and marine mammal husbandry experts from these accredited institutions are in the water taking shifts to care for the calf, working closely with the Center’s team to ensure the animal has the very best chance at surviving the first few days of a rescue, which can be the most critical. 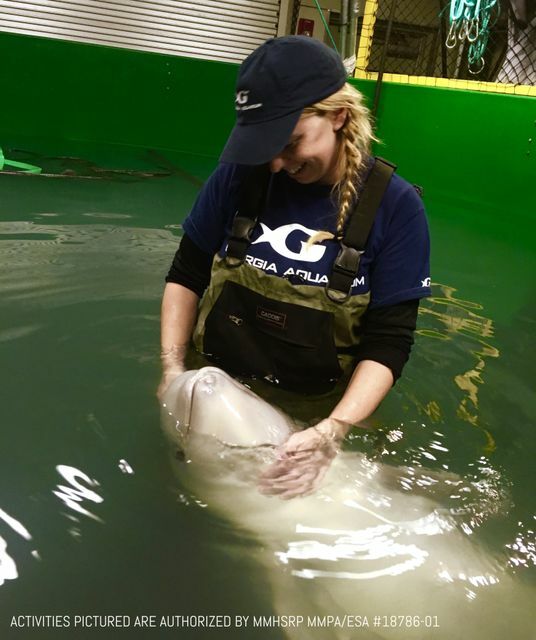 The veterinarians and marine mammal experts at these facilities bring decades of hands-on experience caring for, studying, and transferring knowledge about beluga whales, including this critically endangered population. Georgia Aquarium operates its Georgia Aquarium Conservation Field Station in Marineland, Florida that responds to dolphins and small whales in distress or entangled in debris. With any cetacean rescue, particularly with a neonatal calf, there is a high risk of complication and survival is estimated at less than 10 percent. The beluga calf was 162 centimeters long (64 inches) and weighed 64.5 kilograms (142 pounds) when it arrived at the Center.